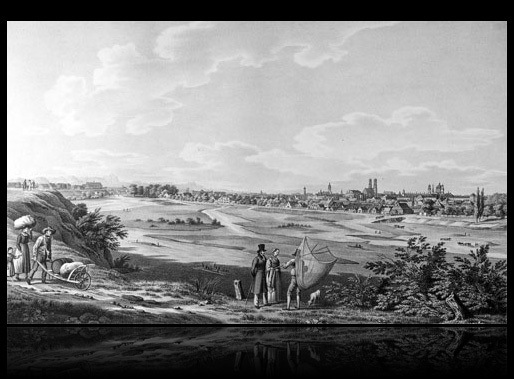 Lithograph on paper, 25 x 41 cm ( 9.8 by 16.1 in), by G. Kraus, printed by Lacroix, dated 1832. 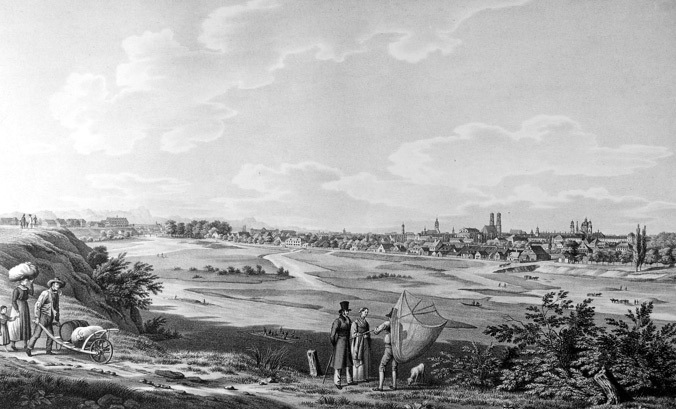 View of Munich from the northeast over the river (Isar), with the mountains in the background. In the foreground a couple and a fisherman in conversation, left a farmer family with wheelbarrow and on the river two rafts. The artist has been in Munich since 1825, as a student of Wilhelm von Kobell at the local Academy. His representations from the Bavarian people's live are important documents from the time of Biedermeier. He is one of the important lithographer and with his urban architectural views from the southern German region, especially Munich, also a important rapporteur from this era. Literature: Thieme-Becker, vol XXI, pp. 451-52; Bruckmanns Lexikon der Münchner Maler im 19. Jahrhundert, vol 2, pp 382-84, fig 548; Christine Pressler, Gustav Kraus 1804-1852, monography and Catalogue Raisonné, dissertation, Munich 1977. Splendor and very decorativ rare print in fine condition. Further details and price on request.